Stainless Steel, polished 37mm case with soft pink color Mother of Pearl diamond dial, and diamond bezel. Two different time zones and big date are displayed at all times. 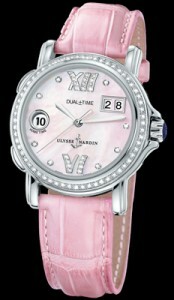 It features a glass exhibition back and is vailable on elegant pink leather strap with pin buckle.